I spoke in Parliament last night about the high rate of road fatalities in Lake Macquarie. A lot of people are quick to blame the roads, but in my opinion they are not the main cause. Poor driver culture and behaviour, in-car distractions, drink driving, excessive speed and mobile phones are the main cause of accidents. The fatality rate in our area is one and a half times the State average. The police can't solve all of the problems and neither can the politicians. We need to take ownership of this problem as a community and fix it. Mr GREG PIPER (Lake Macquarie) (18:43:11): In Lake Macquarie we have a problem but it is one we are trying to take ownership of before more precious lives are lost. Too many people are being killed or seriously injured on our roads and with the fatality rate in our area 1½ times the State average it is not something we can continue to ignore. Some people are quick to blame the roads but in my opinion that is not the main factor. In the four years from 2012 to 2016, 21 people were killed on our local roads and 307 were seriously injured. In 2017 a further eight people lost their lives. In the five months to May this year, another four people were killed and a further 50 people were seriously injured in road crashes. People are expected to drive to the conditions, and with modern vehicle safety now a feature on most cars, along with the fact that most accidents are not happening at blackspots, we have to ask ourselves: What is the cause of these accidents? Clearly, a large part of the answer is poor driver behaviour and attitude, combined with in-car distractions. The most obvious of these is mobile phones but there are plenty of stories of other outrageous behaviour while driving that adds to that list. People do not have to travel too far in the electorate to see roadside memorials to lost loved ones. Sometimes the memorials are to people who made bad choices, who took silly risks, rolled the dice and lost. Some are simply memorials to innocent victims, but all of them are to people who were loved by their families and friends, and who lost their lives all too early. I recently posted a video on Facebook that I produced with the assistance of our local area commander, Superintendent Danny Sullivan. It received a huge response with more than 4,000 views recorded in the first few days of publishing. Danny Sullivan and his officers are in the front line when it comes to picking up the pieces after road crashes and I know they dread getting the calls that require their assistance at road crashes. Superintendent Sullivan would also say that there are four things that underline most of these horrible statistics: drinking and driving, speeding, not wearing a seatbelt, and being distracted by mobile phones. These are all choices that people make. That is where the conversation in our community must start and why this conversation is so important. 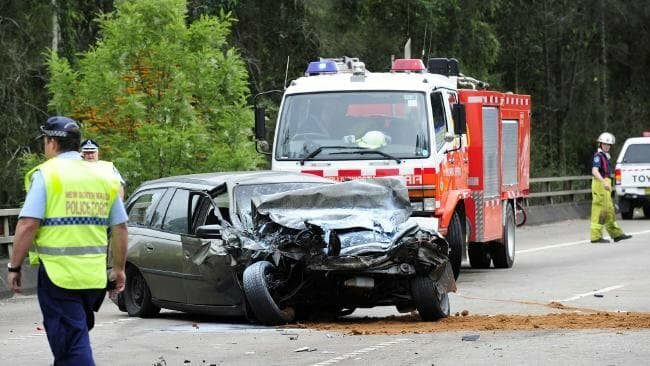 At the moment, Lake Macquarie is sadly leading the area in the number of fatal collisions, but when we look closer at the reasons behind those collisions we find that most of the time they were caused by very poor attitudes to road safety. These choices are across all demographics and are not limited to a younger generation as some would think, but the use of mobile phones has been a factor in way too many collisions. People trivialise that so easily. Superintendent Sullivan says that every time his officers pull someone over for using a mobile phone, their first words are "I was just". "I was just looking at the map." "I was just reading a message." "I was just updating my Facebook." Andrew was just riding his motorbike on his way to work, like any normal day. We need awareness created for drivers of all ages, to wait, be patient, don't be in such a hurry. Please let me help in this. Kind regards Jackie Titmarsh—a grieving widow. What started as just a normal day became the worst of days for that family. I wish there was something more meaningful that I could do for those such as Jackie and her family, confronted with such a tragic loss, but their grief is intensely personal; little I could do or say would change that pain. We can, however, try to stop one more person dying senselessly by getting the message out and by owning the problem as a community. Changing attitudes is not easy, but it is essential if we are to continue lowering the road toll in New South Wales. My thanks go to the police and all first responders for their keeping us safe on our roads. I particularly acknowledge what they do when they unfortunately have to respond to one more tragedy on our roads to pick up the pieces so tragically left there. TEMPORARY SPEAKER (Mr Greg Aplin): I thank the member for Lake Macquarie. As Chair of the Joint Standing Committee on Road Safety I commend his observations and his very wise advice.